Vita Coco, the leading coconut water firm, has announced an expansion of its product line in the UK with the launch of Vita Coco Coconut Milk Alternative. Promoted on pack as “delicious, smooth & dairy free”, Vita Coco Coconut Milk Alternative is described as a blend of coconut cream and coconut water with “a whole lot of coconut”. It is also touted as containing added calcium and vitamins, and as being free from gluten and added sugar. Recommended uses for the product include as an alternative to milk with cereal, as a drink in its own right, and as a complement to tea and coffee. Commenting on the launch, Vita Coco EMEA chief executive Giles Brook said: “Our strategy is to become synonymous with all things coconut and our Vita Coco Coconut Milk Alternative launch is at the very core of this. As well as being majority coconut, not water-based, the other major differential is the taste, which we capture under our ‘tastes like no udder’ sign off”. 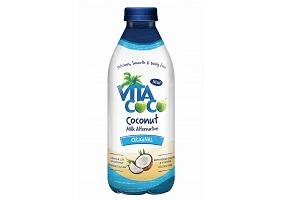 Vita Coco Coconut Milk Alternative joins the existing Vita Coco line-up of coconut water and coconut oil, and will retail in 1l plastic bottles for £2.99 ($3.72).